You are here: Home / Podcasts / Responsibility vs Blame: Do you know the difference? 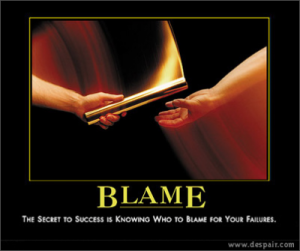 Responsibility vs Blame: Do you know the difference? You and I can choose to change our bodies, or we can choose to stay as we are. Regardless of your circumstances it’s still a choice. And you will always be responsible for that choice and your body. Not the path to successful change...but great poster...love despair incs posters. There are very few people who simply have no choice when it comes to making a real change in their bodies. For the vast majority of us and that likely includes you, there is simply the choice to make a change and then following through with that choice. There is noobody to ‘blame’ and nobody who will take responsibility for your body besides you. There will be real effort involved, there will be considerations and attention to detail that will be required on the diet and there will be time and dedication required in the gym. Make no mistake about it, you can change as much as you want once you commit to it. There is however another type of change that you may not realize has to happen in order for you to get where you want to go. And that is a mental change. Many of us has self defeating mental mindsets and programs that we are almost completely unaware of. We can easily fall into a self destructive pattern for one of many reasons. We may me too critical of ourselves, or want perfection when it simply does not exist. Holding yourself to an unrealistic and unattainable standard is a sure fire way to sabootage your success just when you start to make real progress. In order to make a lasting change in your body you need to also make the associated mentall changes that will make the process possible without defeating yourself. The reason most people eventually give up on a diet or gain the weight back that they have lost is not because they weren’t tough enough, it’s because they never worked on the mental side of the change along with the physical side. You must make the process a mind AND body transformation. The process won’t be perfect, there will be ups, and there will be downs. You will doubt yourself along the way…you will stumble, you will fall, you will feel like giving up. This is normal, we all have moments like these. The key is to get back up after you stumble and after you fall forgive yourself for being human, accept that you’re not perfect (nor is anyone else), dust yourself off and get back to work. In today’s podcast, I speak with Dr. Nicola Bird about the process of change and how we learn to blame external factors for stumbling and falling. We discuss how our inner mental voice can be very critical and what the real difference is between blame and responsibility. It’s a bit of a lesson in tough love but it’s the words that many of us need to hear to stay on track and finally make a body transformation that will stick for good.